Guide to South Africas airport customs and SARS, including information, contact details, goods allowances and resticted items and goods. On arrival at a South African airport, you have to pass through customs control, where you may be questioned and your baggage may be scanned or searched for dutiable, restricted or prohibited goods. Travellers with goods to declare must complete a Traveller Card and make a verbal declaration of their goods to a customs officer, who will then generate a Traveller Declaration. If you're found with undeclared, restricted or prohibited goods, you could be fined or even face prosecution. 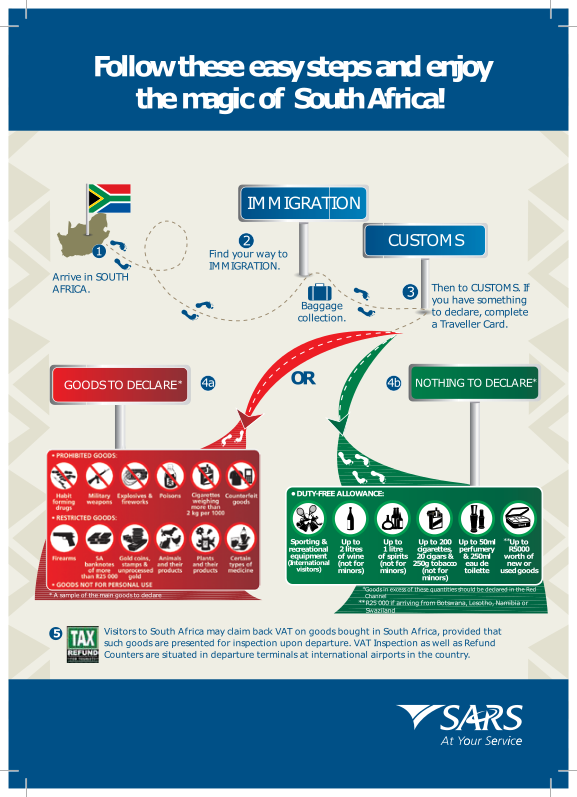 To help you avoid this, and make your arrival and departure from South Africa as smooth as possible, here's a quick guide to moving goods in and out of the country. Cigarettes - up to 200 per person. Cigars - up to 20 per person. Cigarette or Pipe Tobacco - up to 250g per person. Perfume - up to 50ml per person; Eau de Toilette (scented liquid lighter than cologne) - up to 250ml per person. Wine - up to 2 litres per person. Spirits and other Alcoholic Beverages - up to 1 litre in total per person. People under 18 can claim this duty-free allowance on consumable goods - with the exception of alcohol and tobacco products - provided the goods are for their personal use. You are allowed to bring in one month's supply of pharmaceutical drugs or medicines for your personal use. Any other pharmaceutical drugs or medicines must be accompanied by a letter or certified prescription from a registered physician, and have to be declared. You can bring in personal effects, sport and recreational equipment, either as accompanied or unaccompanied baggage, for your own use during your visit. In the case of very expensive articles, you may be required to lodge a cash deposit to cover the potential duty/tax on their re-export. The deposit will be refunded on departure after a customs officer has inspected the items and verified that they are being re-exported. In addition to the personal effects and consumables duty-free allowances, you are allowed to bring in new or used goods in accompanied baggage to the value of R5 000, or R25 000 if arriving from Botswana, Lesotho, Namibia or Swaziland. If the limits are exceeded, all goods brought into South Africa are subject to the payment of customs duty and value-added tax (VAT) - including goods bought duty-free on aircraft or ships or in duty-free shops. For goods of up to R20 000 in value, you have the option of paying customs duty at a flat rate of 20%. Flat-rated goods are also exempt from payment of VAT. This is valid only once per person per 30-day period. People under 18 can opt for the flat-rate assessment, provided the goods are for their personal use. Once you're over the additional R20 000 limit - or if you waive the flat rate option - then duty will be assessed and paid on each individual item you're carrying, and an additional 14% VAT will be charged. South African bank notes in excess of R25 000; foreign currency above $10 000; gold coins, coin and stamp collections, and unprocessed gold above $10,000 in value. Certain goods are restricted, and may only be brought into South Africa if you have the necessary authority or permit, and these must be declared on arrival. They include any firearms, as well as Species of plants or animals that are listed as endangered, whether they are alive or dead, as well as any parts of or articles made from them. All plants and plant products are restricted, such as seeds, flowers, fruit, honey, margarine and vegetable oils. Also animals, birds, poultry and products thereof, such as dairy products, butter and eggs. Further Information can be found on the South African Revenue Service (SARS) website. For travellers, an excellent SARS Travellers Guide is available for download - SARS Guide.pdf. This is a comprehensive and easy to understand guide aimed at travellers and tourists who may be visiting South Africa for the first time.